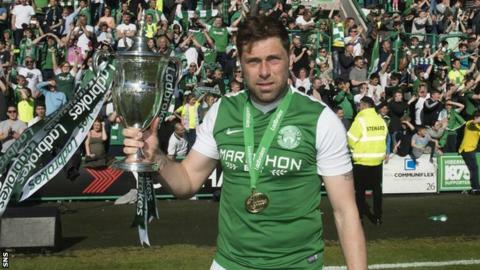 Striker Grant Holt will leave Hibernian when his contract ends this summer, the club have confirmed. Joining Holt through the exit door will be Alex Harris, Chris Humphrey, Scott Gallacher, Brian McLean and Jamie Insall as their deals also expire. Holt, 36, has scored seven goals in 39 appearances this term as the Easter Road outfit clinched the Championship title and promotion to the Premiership. Harris came through the club's youth ranks and has made 60 appearances. It was confirmed this week that Hibs striker James Keatings will leave in the summer after signing a pre-contract agreement with Dundee United. Humphrey joined Hibs in January from Preston but the former Motherwell winger made just eight appearances due to a calf injury and is expected to return to England. Goalkeeper Gallacher and defender McLean arrived on short-term deals during the season, while Insall - who this week failed a drugs test - spent the vast majority of his two years with the club on loan with East Fife.